The Google Assistant can speak in John Legend's voice and make calls on your behalf. Google just demonstrated a remarkably natural Google Assistant at the Google I/O 2018 opening keynote. It can speak more conversationally, understand the user better, teach kids manners, and make surprisingly convincing robocalls for you. Users no longer have to speak the ‘Hey Google’ wakeword after every command. Instead, the Google Assistant will keep listening and keep the conversation going. It also has seven new voices, including that of John Legend’s. Sundar Pichai kicked off I/O 2018 with an apology for getting the burger emoji wrong and soon veered into the strides Google has made in the world of AI and machine learning. The breakthroughs Google achieved over the past few years is going to show up in Google’s offerings. One of the biggest recipients of those breakthroughs is the Google Assistant. It’s as fluent in conversation as Siri, and more functional than ever. The most noticeable change is going be the voice. The Google Assistant has been trained to speak more naturally. It can emphasise phrases based on the context, adjust the pitch and tone of its voice, and switch between seven diverse voices. Including John Legend’s. The singer’s voice has been combined with Google Deep Mind’s Wavenet AI to generate a voice for Google Assistant that sounds intensely personal. Legend’s voice is only available in certain situations, though. But the other new voices are there all the time and across other apps like Maps. Once you get past the polished voice and start having a conversation, Google Assistant won’t ask for the wakeword every time. You can hold a longer conversation with the Assistant. Google calls it ‘Continued Conversation’ and during the keynote, Scott Huffman, the VP of Engineering at Google, demonstrated a three line long conversation with the Google Assistant, using the ‘Hey Google’ wakeword just once at the beginning. You can also ask more than one thing in one command. With what’s called ‘Multiple Actions’, Assistant can understand you are asking for two things at once. So when you ask Google Assistant to “dim the lights and turn on the music”, it will understand you are asking for two separate things and get it done. Because of the Assistant, Pichai thinks, kids might become uncouth and forget their manners. So with a new feature called ‘Pretty Please’, Google Assistant will urge users to ask for things nicely. Available for families, the Assistant will chime in a word of encouragement every time it’s commanded with a ‘please’. On the new smart speakers that Google announced in partnership with JBL, Lenovo, Sony and more at CES 2018 earlier this year, will get YouTube TV powered by the Google Assistant. Users can watch TV shows live, watch recipe videos and more. You can also make video calls, check the traffic, and place food orders in select restaurants. The Assistant can remember your usual order. For instance, it will know your usual order at Starbucks and place it for you along with passing on the suggestions and remarks. The most dramatic ability that the Google Assistant was to make calls on behalf of the user. 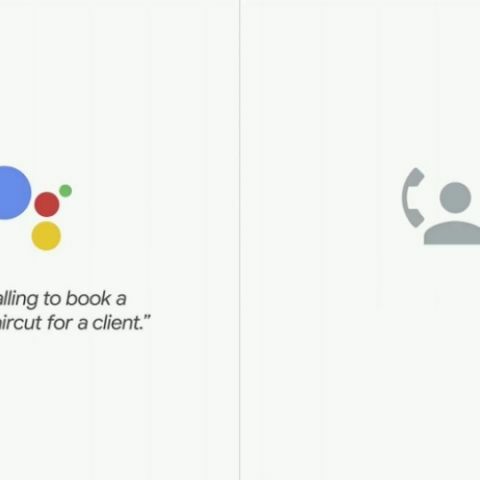 Huffman demonstrated the Google Assistant making an appointment in a salon by calling up the place. It sounded so natural that the person on the other side didn’t realise that it was a robot speaking. The call wasn’t placed live. It was pre-recorded, and it might not work that seamlessly. Google said it’s a new technology and will roll out as an experiment. The Assistant relies on a new technology called Google Duplex that combines machine learning and natural language processing to hold a natural conversation with the person on the other end. It remains to be seen whether it has cracked the Turing Test though. Huffman also announced that the two-year-old Google Assistant is now running on 500 million devices over 500 different types of products, and the new features that were announced will roll out to users over the coming weeks. Some of these features like Google Duplex might not be available for India that quickly, but features like smoothe conversations, new voices and the likes are expected to arrive soon this month. Anyone know, plz tell ?